Ageing is widely associated with several physical, psychological and behavioral changes . Furthermore, these changes are closely related with global health and functional capacity in the elderly [1-3]. Physical abilities impairment directly affects the functional motor capacity, since a person needs muscle strength and power, flexibility, balance, coordination and aerobic/anaerobic endurance in order to perform activities of daily living (ADLs) [1, 4-6]. Thus, as the aging process changes the functioning of body systems (cardiorespiratory, musculoskeletal, nervous, immune, endocrine, among others), elderly persons experience impaired functionality and disability [1, 7]. On the other hand, psychological and behavioral aspects can hinder the elderly's ability to perform ADL due to indirect mechanisms (e.g. low self-esteem, apathy and hypokinestetic behavior) . Mood disorders such as depression are common in the elderly, resulting in reduction of the level of habitual physical activity [3, 44]. Low physical activity levels lead to diminished physical fitness and, consequently, impaired functional motor capacity. For this and other reasons, the elderly suffering from mood disorders tend to avoid exposure to instrumental ADLs, which require greater motor and cognitive complexity [8, 9]. Therefore, the factors that play a role in functional disability and mood disturbances in the elderly deserve further investigation, since physical inactivity and mental disorders are some of the factors that are associated with increased risk of mortality . One of the strategies for improvement of the general aspects of health and especially the increase in physical fitness and neuroprotection is the increased level of physical activity , that may occur by the amount of motor activities on a daily basis, as well as by engaging in programs of regular physical activity (i.e., physical exercise). From the results presented in the literature on the benefits of a healthier lifestyle, public physical activity programs have been created in Brazil to increase the level of physical activity of population and therefore prevent diseases and promote health [12, 13]. Many questions have arisen about the actual effectiveness of Brazilian public they do not follow all the recommendations for physical activity interventions and professionals and managers who run these programs lack the required technical and scientific knowledge [14, 15]. Due to the lack of systematic physical activity parameters such as intensity, it is possible that the proposed program is not enough to produce physiological and functional improvements, especially considering that many studies on this topic carried subjective measures of physical fitness through perception questionnaires or survey data [14, 16]. For this reason, it is necessary to assess both mental and physical aspects of elderly participants of physical activity programs by the Brazilian government and compare them with physically inactive elderly, in order to identify whether or not these programs are effective. Therefore, the aim of this study was to evaluate the mood state and functional motor capacities of elderly women engaged in physical activities of a public physical activity program in Rio de Janeiro and compare them with physically inactive elderly. This study is an analytical cross-sectional study approved by and was approved by the Research Ethics Committee of the University Salgado de Oliveira (approval protocol nº 1.220.341). All procedures performed in this study were in accordance with the ethical standards of Brazilian Council of Health and with the 1964 Helsinki declaration and its later amendments or comparable ethical standards. Participants signed a consent term and the study was approved by Ethics Committee in Research of the Universidade Salgado de Oliveira (nº 1.220.341). Fifty five elderly women were recruited and evaluated at the Clinical Fisioprime Physiotherapy, located in Campo Grande, Rio de Janeiro, Brazil. Prior to the evaluation all volunteers were informed regarding the study’s procedures and signed an informed consent form. Participants were included if they had 60 years or more and excluded if they were participating in any kind of physical exercise program, use of psychotropic drugs, had any neurodegenerative disease or acute musculoskeletal injury. Twenty- five elderly women were excluded (did not met inclusion criteria or declined to participate). Thereby, a total of thirty participants were included in the study and were categorized into two groups based on physical activity levels: physically active elderly women group or physically inactive elderly women group. Participants’ physical activity level was classified according to information provided in a personal questionnaire. Participants in the physically active group (PAG) participated in a public physical activity program where they performed group-based walking activities, stretching and dance from two to three times per week engaged at least three months (n = 16). 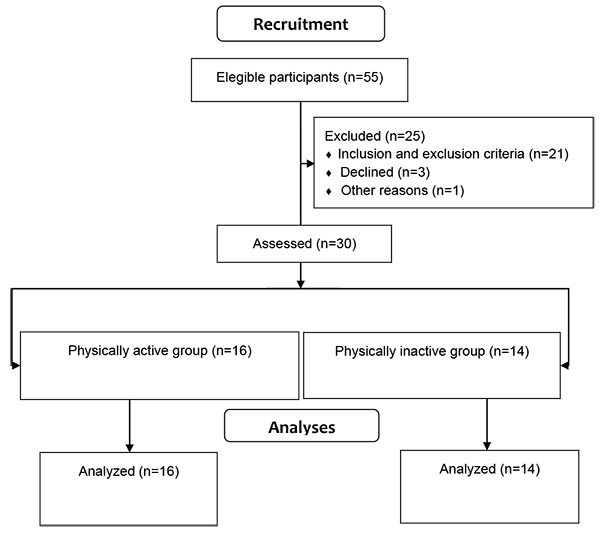 Participants from the physically inactive group (PIG) did not enroll in the public physical activity program and did not perform any kind of physical activity, except for ADLs (n = 14). Before anthropometric assessment, the participants completed an interview with questions about family history, pre-existing diseases, lifestyle habits (diet, physical activity and/or exercise) and medication use. Physical activity was considered as any activity of daily living (ADL) or other activities with uncontrolled volume and intensity. If intensity and volume were controlled during any activity, it was considered physical exercise. We just collected the aforementioned information to know our sample. Moreover, we would want to certify any use of diet supplements which could influence mood. Then, they were underwent height (measured with a stadiometer) and body mass (measured with anthropometric balance) measurement. T = tension; D = depression; H = hostility; F = fatigue; C = confusion; V = vigor. There are no cutoff points in any domain of POMS. The scale was validated using an ordinal measurement with no classification of its score. Thus, as higher is the score, higher is the mood disorder. Internal consistency of this scale is considered high (Cronbach Alpha > 0.7). The Sitting and Rising test (SRT) was used to assess functional motor capacity. This test evaluates the participant’s ability to sit and get up from the ground, a functional task which requires several physical aptitudes, namely muscle strength, balance and flexibility . Moreover, SRT is not only associated with functional capacity but it is also a predictor of all-cause mortality . Each participant initiated the test with five points. Half a point was subtracted for each loss of balance and one point for each time the participant used any body part for support. Each action (sitting down and rising up) was scored independently. Detailed scoring is shown in Table 1. Table 1. Score of sit to raise from floor. Descriptive and inferential statistics were used. Conceptual assumptions for conducting parametric analyzes were verified. For this we used the Shapiro-Wilk test (to check for normal distribution) and the Levene test (to check for homogeneity of variances). Despite the ordinal nature of the POMS questions, the data can be converted to a continuous variable. Therefore, if normality and homogeneity of variances were assured, parametric tests were used. Independent t Tests were used for between-group comparisons regarding TMD total and domain specific scores. Due to non-normal distribution, the Mann-Whitey U test was used for between-group comparisons regarding SRT scores. Demographic data were compared between groups to test homogeneity. All tests were performed using SPSS 17 and the level of significance was set at p≤0.05. In addition, between-group effect sizes (ES) were calculated, according to Cohen [20, 21]. There were no group differences regarding age (t = 0.35, df = 28, p = 0.72), body mass (t = 0.59, df = 28, p = 0.55) and height (t = 0.84, df = 28, p = 0.4). Hypertension was the most informed disease by participants. Results are shown in Table 2. Flowchart of recruitment process is shown in Fig. (1). Table 2. Comparison between groups. Mean ± standard deviation, median (minimum; maximum). BW: body weight; TDM: total disturbed mood; TSF: Test to sit and raise from floor; S: sit; R: raise; PAG: physically active elderly women group; PIG: physically inactive elderly women group. *Independent t Test; #Mann-Whitney U Test. Fig. (1). Flowchart of the recruitment process. There were statistically significant between group differences in TMD (t = -2.41, df = 28, p = 0.02), tension (t = -2.909, df = 28, p <0.01), fatigue (t = -2.611, df = 28, p = 0.01), confusion (t = -2.800, df = 28, p <0.01) and hostility (t = -2.078, df = 28, p = 0.05), with lower scores in the physically active group in comparison to the physically inactive group for all variables. However, there were no significant differences in depression (t = -1.556, df = 28, p = 0.13), vigor (t = -0.522, df = 28, p = 0.6) and SRT sitting (U = 86.00; p = 0.25) and rising performance (U = 69.00; p = 0.06). These results are detailed in (Table 2 and Fig. 2). Fig. (2). Statistically significant between groups differences in POMS subdomains. *(p≤0.05). The ES ranged from trivial to large, but only the “vigor” domain was classified as trivial, while the “depression” domain was classified as moderate; and other domains and TMD were classified as large (Table 3). Table 3. Effect Size between groups (mood). TDM: total disturbance of mood; TSF: test of sit to rise from floor; S: sit; R: rise. The aim of this study was to assess the mood state and functional motor capacity of elderly women engaged in a public physical activity program in Rio de Janeiro and compares them with physically inactive elderly. Our results showed that physically active elderly women had lower TMD, fatigue, confusion and hostility than physically inactive elderly. However, functional motor capacity assessed by the participants’ ability to sit down on the floor and rise up again was not statistically different between groups. There were moderate to large between group effects favoring the physically active group in all assessed outcomes, with the exception of vigor (trivial effect) and SRT Sitting subtest (small effect). Our results regarding mood disturbance are consistent with the literature on physical activity and mental health [11, 22]. Individuals more physically active and consequently with greater physical fitness, have a lower risk of developing mood disorders, Parkinson’s and Alzheimer’s disease [11, 23-25]. Furthermore, Backmand et al. showed that individuals with high levels of physical activity during youth had less chances of developing mood disorders late in life. Our results also corroborate other previous findings stating that high levels of habitual physical activity (frequent performed physical activity) are associated with positive affect . Sarid et al. actually found a positive association between self-reported physical activity and greater joy and vigor in the elderly. Therefore, a more active lifestyle can reduce the risk of developing health problems, mainly mood related disorders. Our results are also likely explained by the combined effects of physical activity and social interaction , since the active elderly women engaged in group-based physical activities. Social interaction may have been associated with motivational enhancement provided by the “neurobiological reward system”, which is directly involved in mood related processes . Regarding the motor functional ability to sit and rise from floor, our findings showed no statistically difference between PAG and PIG. This finding is supported in part with other studies that found no association of habitual physical activity level with physical performance, such as muscle strength and balance, despite the relationship with other capabilities (time climbing stairs and walking speed) [31, 32]. In a study conducted for 10 years, Daly et al  showed that the level of habitual physical activity reduced the loss of bone density in the elderly, but did not alter muscle strength and gait speed. Therefore, the level of physical activity can be a determining factor for some functional abilities, but not all. According to the context, it is important to note that the findings of functional motor skill are in part in accordance with the few similar studies, which investigated the functional fitness of elderly participants of physical activity programs promoted by government agencies in Brazil. These studies have shown conflicting results of functional capacity of the elderly participants in these programs. For instance, Guimarães et al. and Santos et al. found that older people engaged in a public physical activity program only displayed significant improvement on functional motor capacity after the intervention. However, when the authors compared the differences pre-/post-program for active seniors with inactive elderly (not engaged in physical activity, but assessed at the same times of active elderly) all variables showed increased values of functional capacity. Therefore, the disparity in the findings on the functional performance of the elderly in physical activity programs managed by public agencies in Brazil shows a necessity to revise the procedures used in conducting such activities. Although unsystematic physical activity has benefits, it is necessary to include the controlled physical exercise in such programs, so that the intensity of activity be prescribed and monitored, providing physiological adaptations and thus improving functional performance. Unsystematic physical activities, especially without intensity control, may provide equivocal results on functional capacity of the elderly [36-38]. On the other hand, a simple walking exercise program, but with intensity monitored at moderate level (50-70% of heart rate reserve) was effective in motor functional aspects . In summary, in addition to physical activity (e.g. ADL, and active leisure activities), physical exercise (planned and repetitive activities with controlled volume and intensity) is necessary to extend the benefits and avoid functional dependence . There is some evidence highlighting the functional and mental health benefits of physical activity in the elderly. However, in fact, these studies have investigated the effects of physical exercise (regular and systematic physical activity) not physical activity alone (e.g. ADLs) , while articles that differ on the functional effects actually investigated unsystematic physical activity [36, 40, 41]. Harris et al  showed a negative association of physically active individuals with the incidence of depression. However, the authors state that there was no control of the duration and intensity of these activities, making it difficult to understand whether the activities were systematized or not. Therefore, although the literature shows the beneficial effects of higher levels of physical activity on mental health, physical performance and more expressive neurobiological responses are more consistent when the exercise is performed [11, 22, 43]. However, according to the official Position Statement of the American College of Sports Medicine, any amount of physical activity is better than inactivity . The present study has some limitations such as small sample size but mainly the study design (cross sectional). Although there was an association between physical activity and mood disturbance we cannot establish a cause-effect relationship. Therefore, our results should not be generalized. In conclusion, the overall mood disorder, as well as the tension, confusion, fatigue and hostility, showed a lower score in active elderly women than in physically inactive older ones. The lack of difference in functional motor capacity between the physical active and inactive elderly may be explained by the absence of physical activity systematization (exercise with controlled volume and intensity) in these programs. This work was supported by Coordenação de Aperfeiçoamento de Pessoal de Nível Superior (CAPES). Chodzko-Zajko WJ, Proctor DN, Fiatarone Singh MA, et al. American College of Sports Medicine position stand. Exercise and physical activity for older adults. Med Sci Sports Exerc 2009; 41(7): 1510-30. Garber CE, Blissmer B, Deschenes MR, et al. American College of Sports Medicine position stand. Quantity and quality of exercise for developing and maintaining cardiorespiratory, musculoskeletal, and neuromotor fitness in apparently healthy adults: guidance for prescribing exercise. Med Sci Sports Exerc 2011; 43(7): 1334-59. Onishi J, Umegaki H, Suzuki Y, Uemura K, Kuzuya M, Iguchi A. The relationship between functional disability and depressive mood in Japanese older adult inpatients. J Geriatr Psychiatry Neurol 2004; 17(2): 93-8. Al-Abdulwahab SS. The effects of aging on muscle strength and functional ability of healthy Saudi Arabian males. Ann Saudi Med 1999; 19(3): 211-5. Alexander NB, Ulbrich J, Raheja A, Channer D. Rising from the floor in older adults. J Am Geriatr Soc 1997; 45(5): 564-9. Daley MJ, Spinks WL. Exercise, mobility and aging. Sports Med 2000; 29(1): 1-12. Lai HY, Chang HT, Lee YL, Hwang SJ. Association between inflammatory markers and frailty in institutionalized older men. Maturitas 2014; 79(3): 329-33. Giebel CM, Challis D, Montaldi D. Understanding the cognitive underpinnings of functional impairments in early dementia: a review. Aging Ment Health 2015; 19(10): 859-75. Pavela G. Functional Status and Social Contact Among Older Adults. Res Aging 2015; 37(8): 815-36. Lo AX, Donnelly JP, McGwin G Jr, Bittner V, Ahmed A, Brown CJ. Impact of gait speed and instrumental activities of daily living on all-cause mortality in adults ≥65 years with heart failure. Am J Cardiol 2015; 115(6): 797-801. Saúde Md. Avaliação da efetividade de programas de atividade física no Brasil. 2011. Benedetti TR, Gonçalves LH. Mota JAPdS: Uma proposta de política pública de atividade física para idosos. Texto Contexto Enferm 2007; 16: 387-98. Esteves JVDC, Andreato LV, Moraes SMF, Prati ARC. Estilo de vida de praticantes de atividades físicas em academias da terceira idade de Maringá - PR Conexões: revista da Faculdade de Educação Física da UNICAMP 2010; 8: 119-29. Esteves JV, Andreato LV, Pastório JJ, Versuti JK, Almeida HD, Moraes SM. O uso de academias da terceira idade por idosos modifica parâmetros morfofuncionais? Acta Scientiarium. Health Sciences 2012; 34: 31-8. Mezzadri F, Cavichiolli F, Souza D. Sports and Leisure: subsidies for the development and management of public policies 2006. Viana MF, Almeida P, Santos RC. Portuguese adaptation of the reduced version of the POMS Humor Profile. Psychological Analysis 2012 Dec 7; 19(1): 77-92. Araújo CG. Sit-up test: presentation of a procedure for evaluation in Exercise and Sports Medicine. Rev Bras Med Esporte 1999; 5(5): 179-82. Brito LB, Ricardo DR, Araújo DS, Ramos PS, Myers J, Araújo CG. Ability to sit and rise from the floor as a predictor of all-cause mortality. Eur J Prev Cardiol 2014; 21(7): 892-8. Cohen J. Statistical Power Analysis for the Behavioral Sciences. 1988; 2. Cohen J. A power primer. Psychol Bull 1992; 112(1): 155-9. Deslandes A, Moraes H, Ferreira C, et al. Exercise and mental health: many reasons to move. Neuropsychobiology 2009; 59(4): 191-8. Blay SL, Andreoli SB, Fillenbaum GG, Gastal FL. Depression morbidity in later life: prevalence and correlates in a developing country. Am J Geriatr Psychiatry 2007; 15(9): 790-9. Monteiro-Junior RS, Cevada T, Oliveira BR, et al. We need to move more: Neurobiological hypotheses of physical exercise as a treatment for Parkinson’s disease. Med Hypotheses 2015; 85(5): 537-41. Strawbridge WJ, Deleger S, Roberts RE, Kaplan GA. Physical activity reduces the risk of subsequent depression for older adults. Am J Epidemiol 2002; 156(4): 328-34. Bäckmand HM, Kaprio J, Kujala UM, Sarna S. Physical activity, mood and the functioning of daily living A longitudinal study among former elite athletes and referents in middle and old age. Arch Gerontol Geriatr 2009; 48(1): 1-9. Pasco JA, Jacka FN, Williams LJ, Brennan SL, Leslie E, Berk M. Don’t worry, be active: positive affect and habitual physical activity. Aust N Z J Psychiatry 2011; 45(12): 1047-52. Sarid O, Melzer I, Kurz I, Shahar DR, Ruch W. The effect of helping behavior and physical activity on mood states and depressive symptoms of of elderly people. Clin Gerontol 2010; 33: 270-82. Blechner MJ. Interactions of social and neurobiological factors in depression. Contemp Psychoanal 2013; 44: 571-80. Russo SJ, Nestler EJ. The brain reward circuitry in mood disorders. Nat Rev Neurosci 2013; 14(9): 609-25. Morie M, Reid KF, Miciek R, et al. Habitual physical activity levels are associated with performance in measures of physical function and mobility in older men. J Am Geriatr Soc 2010; 58(9): 1727-33. Aoyagi Y, Park H, Watanabe E, Park S, Shephard RJ. Habitual physical activity and physical fitness in older Japanese adults: the Nakanojo Study. Gerontology 2009; 55(5): 523-31. Daly RM, Ahlborg HG, Ringsberg K, Gardsell P, Sernbo I, Karlsson MK. Association between changes in habitual physical activity and changes in bone density, muscle strength, and functional performance in elderly men and women. J Am Geriatr Soc 2008; 56(12): 2252-60. Guimarães AC, Andrade Quintão Coelho Rocha C, Marques Gomes AL, Ali Cader S, Martin Dantas EH. Effects of a physical activity program on the level of autonomy of elderly participants in the family health program. Fitness perform. j. 2008; 7(1): 5-9. Penha de Oliveira Santos MI, Harter Griep R. Functional capacity of the elderly attending a SUS program in Belém (PA). Ciência & Saúde Coletiva. 2013; 18(3): 753-61. Nunes ME, Santos S. Functional evaluation of the elderly in three physical activity programs: walking, water aerobics and Lian Gong. Rev Port Cienc Desporto 2009; 9: 150-9. Macedo DO, Freitas LM, Sheicher ME. Handgrip and functional mobility in elderly with different levels of physical activity. Fisioter Pesqui 2014; 21: 151-5. Albuquerque IM, Emmanouilidis A, Ortolan T, et al. Capacidade funcional submáxima e força muscular respiratória entre idosas praticantes de hidroginástica e dança: um estudo comparativo. Rev Bras Geriatr Gerontol 2013; 16: 327-36. Caspersen CJ, Powell KE, Christenson GM. Physical activity, exercise, and physical fitness: definitions and distinctions for health-related research. Public Health Rep 1985; 100(2): 126-31. Dinas PC, Koutedakis Y, Flouris AD. Effects of exercise and physical activity on depression. Ir J Med Sci 2011; 180(2): 319-25. Fox KR. The influence of physical activity on mental well-being. Public Health Nutr 1999; 2(3A): 411-8. Harris AH, Cronkite R, Moos R. Physical activity, exercise coping, and depression in a 10-year cohort study of depressed patients. J Affect Disord 2006; 93(1-3): 79-85. Xu Q, Park Y, Huang X, et al. Physical activities and future risk of Parkinson disease. Neurology 2010; 75(4): 341-8. Noh JW, Kwon YD, Park J, Oh IH, Kim J. Relationship between Physical Disability and Depression by Gender: A Panel Regression Model 2016; 11(11): e0166238.